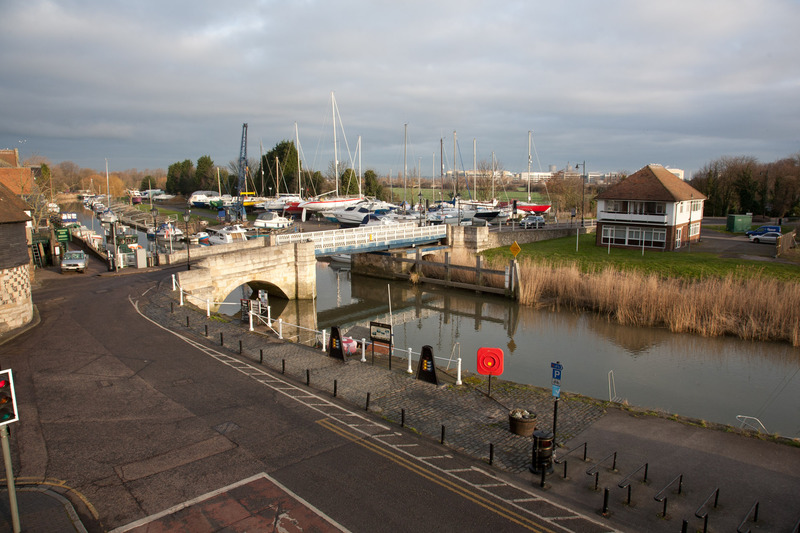 Overlooking the River Stour, The Bell Hotel is located in the heart of the beautiful medieval town of Sandwich, one of the original five Cinque Ports, and has been welcoming guests to Kent since Tudor times. Sandwich is an ideal location from which to explore the Garden of England. The cathedral city of Canterbury is just a 30 minute drive away, and the beautiful seaside towns of Deal, Ramsgate, Broadstairs and Margate are also within easy reach by road and rail. It has great transport links, just a 20 minute drive from the Port of Dover, and 45 minutes from the Channel Tunnel at Folkestone. Sandwich is also a magnet for golfers, with Royal St. George’s and Prince’s golf clubs on its doorstep. And there is always something going on in Sandwich, including Le Weekend in June, a two-day event which sees an authentic French market created in the town, free outdoor concerts featuring French and English musicians, and hundreds of cyclists riding Le Tour de Sandwich. There is also the three-day Sandwich Folk and Ale Festival in July, and the four-day Sandwich Festival in August, boasting a huge range of free music, dance and other entertainment throughout the town. The club has a distinguished golfing history, having hosted amateur and professional tournaments since the 1880s. It is one of England's finest links courses, and has played host to The Open Championship 14 times. The 18 hole championship course will prove a test to all amateur and professional golfers alike. While steeped in history, Prince's Golf Club offers all that is best in modern championship links golf in an idyllic coastal setting. It has 27 holes and practice facilities, along with an acclaimed restaurant, The Brasserie on the Bay. The Secret Gardens of Sandwich are an oasis of serenity waiting to be explored. At the heart of the attraction stands the Grade I Listed manor house, The Salutation, designed by famous English architect Sir Edwin Lutyens. Lutyens also devised the three-and-a-half acres of ornamental gardens with the help of Gertrude Jekyll. After lying neglected for 25 years, the Secret Gardens were recently restored to their original beauty, and are among the finest in Kent. Sited amid the East Kent marshes, Richborough is perhaps the most symbolically important of all Roman sites in Britain, witnessing both the beginning and almost the end of Roman rule here. Explore the huge stone walls which mark the site of this Saxon Shore fortress and take a look at the fascinating museum. Visitors can catch a river boat from Sandwich and reach the fort as the Romans would have done. Sandwich has a delightful range of independent shops to browse during your stay in the town, but if you’re in the mood for serious retail therapy, Westwood Cross shopping centre is only a 20 minute drive. The complex has 53 stores and restaurants, including top High Street names as well as some specialist outlets. Just a 15 minute drive from Sandwich, Wingham Wildlife Park holds more species than any other zoo in Kent, including big cats, reptiles, penguins and primates. And there is a wealth of other entertainment on offer at the park including an indoor soft play area, mini diggers and go-karts, and the opportunity to experience hands-on animal encounters.